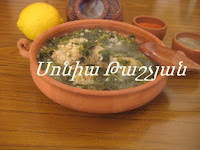 TheArmenianKitchen.com : 'Beans-leaf Soup': Two suggested recipes, but is either one the real deal? 'Beans-leaf Soup': Two suggested recipes, but is either one the real deal? Whenever I receive a recipe request that leaves me baffled, I research my printed resources. When that fails, I ask readers for help. 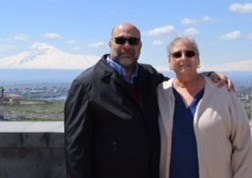 When I get no responses, I seek help from two of my trusted culinary consultants: Sonia Tashjian in Armenia and Ara Kassabian in California. Knowing very little about the recipe, or where Linda’s grandmother came from, made this effort rather tricky. Neither Sonia nor Ara knew of such a recipe, but, boy, did each of them come up with interesting suggestions! We don't know if either suggestion hits the mark. It's up to Linda to let us know. Sonia’s background: Sonia is currently living in Yerevan, Armenia. She has had a TV cooking program, although she insists she’s not a cook. Sonia has spent many years studying and researching all about Armenian traditional cuisine, gathering whatever information and traditional recipes she could from the various villages. She is in the process of preparing a dictionary of Armenian foods. "I guess that the recipe is TBUK KYOFTA from Digranakert's (Diarbekir) traditional cuisine, a mix one. Let me describe it, TBUK comes from the word TUB (which) is a common name given to grape leaves. It's a soup - its whole name is TTABUR & TBUK KYOFTA: ttabur means ttu = sour + abur = soup. So it must be sour, & I think that her grandma had prepared it with matsun, added dried plum (as in aveluk or in other soups, in lent dolma, etc...) to make it sour. The ingredients of ttabur are - spinach or chard leaves, coarse bulghur, lemon juice, chopped & fried onion. First cook the leaves & bulghur in water, add the lemon juice & fried onion, set aside. The ingredients of tbuk kyofta are - drained chickpeas, flour, salt, black & red pepper, mint. Grind the chickpeas, mix the flour & spices, prepare flat & round circles, dipped in extra flour & cook in salty water. Then add the kyoftas in the soup, boil it & serve. The dumplings might be the kyoftas, (KOLOLAK). The bean leaves might be (used) instead of chard leaves. Matsun & plum might be used instead of lemon juice. Of course this is only a (guess); it's my opinion. I suppose it looks like the soup that I suggested. He wrote: "I read the post on your blog but I have never heard of anything remotely like it. The closest thing is the recipe for "Caesaria manti" (kaiserli manti or bokhcha manti in Turkish), which is the version of manti that resembles tortellini and is cooked as a soup in tomato sauce. The recipe does have familiar elements: the use of yogurt, prunes, and the fact that the dumplings are wrapped in a vegetable leaf. My guess is that it is a local village recipe, which is very exciting. I am guessing the dumplings were prepared separately and added to the broth at the last minute in order to prevent them from falling apart. The trick is this: if you wrap anything in leaves and drop it in a boiling soup, the package is going to unwrap. However, if you wrap grain (say, bulgur) in bean leaves, stack them up neatly in a pot, pour water over it, and cook, you could then serve it in a shallow bowl with lots of broth and yogurt. To someone unused to Armenian dishes, it would look like a soup. 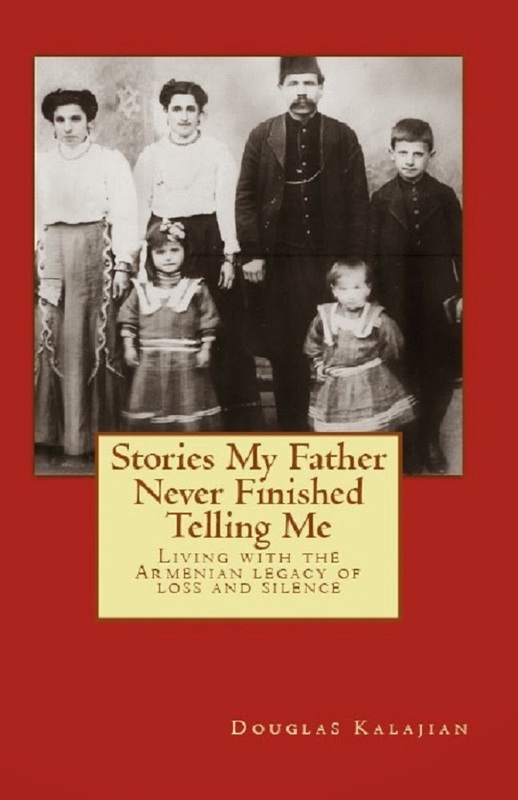 So, my guess is that your reader was describing sarma/tolma made with bean leaves (or possibly grape leaves; she may not have known) and bulgur. Although grape, cabbage, and Swiss chard leaves are most commonly used to make tolma, people used to make them with other edible leaves, like strawberry, beet, and, apparently, bean leaves, which are indeed edible (thank you Wikipedia). Also, prunes and other dried fruit are commonly used instead of tomatoes as a sweet/sour agent in tolmas outside Cilicia. Even in Cilicia, you use tomatoes in leaf tolmas sparingly. My mother never used tomato when stuffing grape leaves (though she did use it for chard leaf tolmas). And, since there was onion in the broth and since the reader referred to the dumplings as "farina-like", I am guessing the stuffing was bulgur. Usually, you use the large size of bulgur for tolma. Possibly, the reader's grandmother ran out or else she preferred to use the smaller size--or the reader could not tell the difference. Postulating that the dish is tolma also explains the size: bean leaves are small and any tolmas made with them will be, indeed, the size of a woman's small finger (though, if her grandmother was a good cook, she would have made all her tolmas that size, with the exception of cabbage tolma). 1 tsp dried basil (I am guessing on this one; you can use other herbs, like tarragon or dill). If you use fresh herbs, increase the amount. Bean leaves from the garden (good luck finding them in a store). Choose them young and as round as possible. Cut out any big veins (though I doubt bean leaves have large veins). You could substitute with grape leaves, fresh or brined, strawberry leaves, etc. I think this recipe would do well with chard leaves as well. 1-2 teaspoons mashed garlic (or to taste). This is optional. Prepare the stuffing by frying the minced onions in the olive oil until they are caramelized. Add the rest of the ingredients minus the chickpeas and the water. Stir fry until well coated. Add the water and par-boil the stuffing (it should be al dente to slightly crunchy). Add the chick peas at the last minute and stir them in gently to avoid breaking them apart. If the leaves are tough (should not be if they are bean leaves), blanch them in boiling water. Remove the large veins, if any. Take a large, rather flat pot and set it on the fire. The pot should be wide enough to hold all the stuffed tolmas when arranged in a wheel. You are going to stack them up and you should have no more than 8 or 10 layers. Add the olive oil to coat the bottom of the pot. Add the sliced onions and the prunes. Fry them a bit until the edges of the onions start to turn brown. Remove from the fire and keep at hand. Place a bean leaf on a cutting board and add a teaspoon of stuffing. Arrange the stuffing in a thin line and wrap the stuffing. There is a trick to doing this and I suggest checking out YouTube videos if you have never done it before. There is also a gadget that makes them, but I don't know if it would work with something as delicate and small as bean leaves. Place the stuffed packages in a wheel pattern in the pot, placing them right next to each other to prevent them from moving while cooking. Add water to just barely cover. Squeeze the lemon. Add an inverted plate on top to keep the pile firmly in place. Drizzle more olive oil. For extra credit, you can arrange a layer of bean leaves at the very bottom of the pot (you are not going to eat them, so you can use the ones that were torn or had a lot of veins, etc.). Bring to a boil, then lower to a simmer, cover, and cook for about half an hour or until the leaves and the stuffing are cooked (no more than 45 minutes, at a guess). Let it rest for a bit, then gently pour out the broth, holding the tolmas in place with the inverted plate. Place a wide flat plate on top of the pot, invert the whole thing onto the plate (this is why the pot has to be flat, so you have no more than an inch or two between the top of the tolmas and the lip of the pot). Make the dip by mixing the mashed garlic and salt into the yogurt. If you don't use garlic, then just beat the yogurt until it is smooth. Serve in shallow bowls with lots of broth and a dollop of dip on top. Alternatively, you can mix the yogurt with the broth and heat GENTLY, stopping short of boiling in order to avoid curdling the yogurt. P.S. All amounts are estimated, so some experimentation may be necessary."